Whether you are planning a romantic weekend getaway with your loved one or fun vacation with your family and friends or you just want a short getaway from Singapore, Bintan Island is the best place for it. PassportChop readers also enjoy special discounts on tours and spa/massage bookings on Bintan Island – read on for more details! Located just 55 minutes away by ferry, Bintan is like a mini-Singapore except with more fun activities to do all compacted into one resort. Tap water in the resort area is drinkable as it had been treated according to international World Health Organisations (WHO) standards just like in Singapore. You can use Singapore currency to buy anything you like within the resort as well as Pasar Oleh Oleh (a market for guests looking for souvenirs, food (e.g. keropok, kueh lapis) and Polo shirts (actually they are everywhere – at ferry terminals, within the resort etc.). 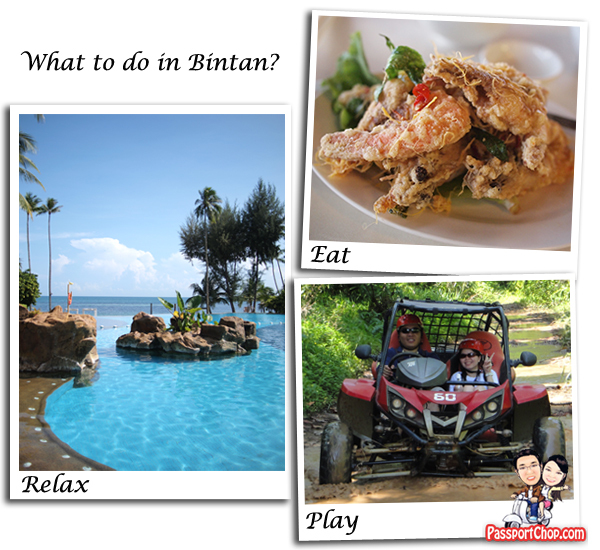 PassportChop.com had the opportunity to visit Bintan Resorts for a short 3 Days 2 Nights weekend getaway recently and we will be sharing with you over the next few posts on what you can do, see and eat in Bintan Island. Shopping at Pasar Oleh Oleh – After an Indonesian cuisine lunch at Spice Restaurant at Mayang Sari Resort, catch a shuttle (S$5 per adult) to Pasar Oleh Oleh – a marketplace selling all kinds of local souvenir and food. Relax at Aroma Day Spa with its 100-minute Destress Package – so comfortable that I felt asleep throughout the massage; includes a 40-minute body scrub. Just before check-out at 12 noon, enjoy the thrill of driving an All-Terrain Vehicle or Dune Buggy across muddy, steep, sandy, bumpy ground – only the toughest conditions to test out how all-terrain the vehicle can manage! Check out this video for a quick preview of our activities at Bintan Nirwana Gardens Resort over a weekend. As can be seen from the above activities described, all fun and relaxing you want your weekend at Bintan Nirwana Gardens Resort to be really depends on you. You can choose to chill out by the beach and relax with a massage or have an action-packed weekend with lots of shooting games and ATV driving or even both! From Singapore – Accessible via high-speed catamarans from Singapore’s Tanah Merah Ferry Terminal (TMFT). The journey takes 55 minutes. Check-in time: 1 hour before departure. Each passenger has up to 20 kg baggage allowance. Tickets are available at Bintan Resort Ferry at TMFT and through selected travel agents in Singapore. From Indonesia – Take a domestic flight to Hang Nadim Airport on neighbouring Batam Island. Regular speedboat available from Nongsa Ferry Terminal in Batam and Bandar Bentan Ferry Terminal in Bintan Resorts. The journey takes approximately 55 minutes. Do take note that Bintan is 1 hour behind Singapore (i.e. 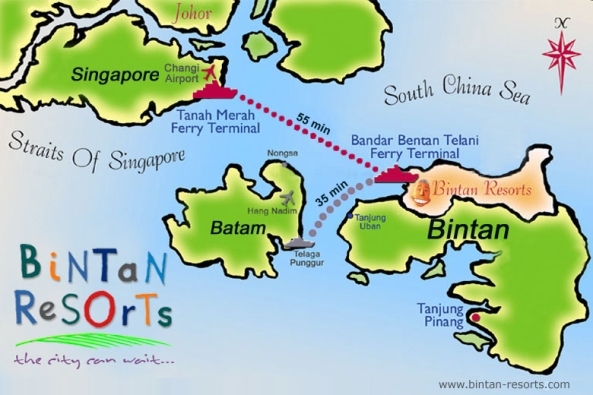 when Singapore time is 2pm, it is actually 1pm Indonesia time – so although your journey from Singapore to Bintan is 55 minutes, you will appear to have arrive at Bintan the same time as when you depart Singapore) so take that into account when arranging any local transportation and tours to avoid any miscommunications. Two-way transfers between your hotel and ferry terminal will be provided by the Nirwana Gardens hotel. Please approach Nirwana Gardens staff who will be most delighted to show you to the coach. To book, email preferred tour time to [email protected] or call +62 (770)692092/29 (at least 48hrs i.e. 2 working days in advance) and quote ‘PassportChop’ in email booking. Oh really nice one which will be help to give unique and enjoyable travel experience. Much good thing is that about this blog post you mentioned good list at what time what you will do. Bintan looks interesting. As someone who travels the world as much as possible, discovering new places (at least to me) is like being given a new toy when I least expected it. 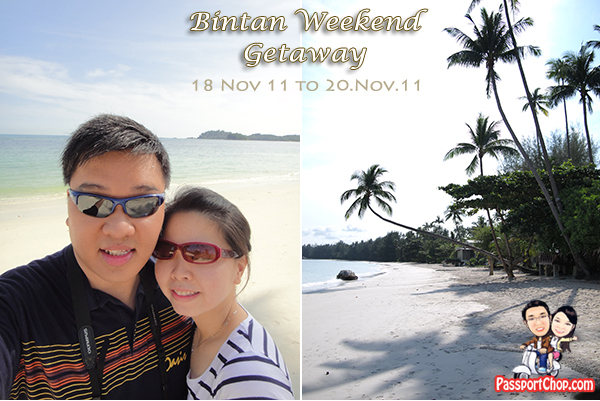 I’ll definitely include Bintan in my to-visit list. Hi there! Amazing piece of writing! I am just a ordinary website visitor (much like addict ) of this website unfortunately I had a trouble. I’m so far from being absolutely sure if its the right place to ask, but there are no spam comments. I receive comments every single day. Could you assist me? Gives thanks! Hi. I would like to know for all the activities, are they near to each other or do we have to travel around ( or even worse, all over the island) to try out all the activities? I just want to make sure eg. I can do ATV ride here and later on not to know that I have to travel far just to do other activities. all the activities are near to each other e.g. archery & shooting at Bintan Resort Centre is a 5 minutes walk away from the resort; the ATV is also 5 minutes away in a different direction – the kelong seafood and pasar oleh oleh are accessible by a free and paid shuttle bus respectively.